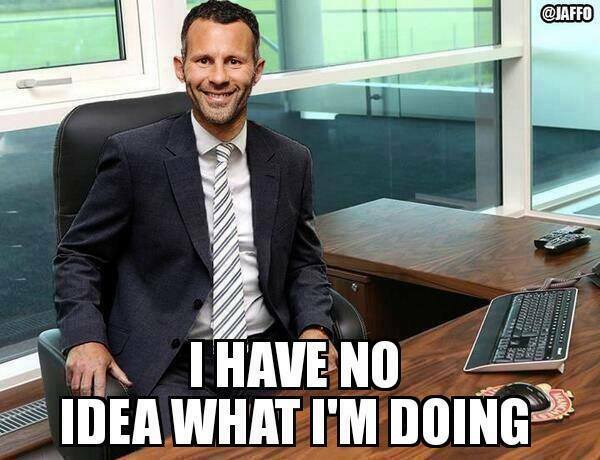 A Manchester United loss at home shouldn’t be a big surprise to anyone, but Ryan Giggs losing his first match as interim manager of the club resulted in plenty of new and old memes resurfacing, pointing the fingers at players and not David Moyes, who was fired for their incompetence. It was an awful match from the Red Devils, who looked once again like the club that lacked energy, drive and any sort of creativity during their disappointing run with Moyes for most of the season. Giggs’ special influence lasted only for one match, and it didn’t seem like his team selection turned out to be a very good one as well, using too many players who won’t be even with the club next season. Alex Ferguson seemed to get so bored he fell asleep in his seat, although there’s a better chance he was simply playing with his phone. It doesn’t matter. One image, maybe taken out of context, added to the bigger picture of something else: Ryan Giggs, someone who helped design a sabotage to get David Moyes sacked, and not the “chosen one” as so many Manchester United fans were hoping he’d turned out to be. So no Europe next season, and not even a happy ending to this one. It started out well with a meaningless title but turned out to be the club’s worst season in over 20 years, that didn’t just take them away from the Champions League next season or from title contention, but actually made it into a laughing stock in the eyes of many, including their own players.